We did it! I’m now officially a married woman, lovelies! 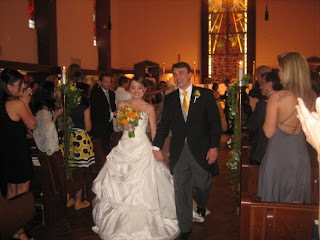 The wedding passed all my wildest expectations, and was far and above the best day of my life!!! I have never felt anything more overwhelming than standing on that altar and pledging my love and fidelity to Mr. Wonderful. The weather was perfect, our vendors were *amazing*, and we enjoyed every minute of it. Mr. Wonderful’s mother was even discharged from the hospital in time to attend both the rehearsal dinner and the ceremony! Big praise. The day was a little bittersweet, however, as my grandmother was hospitalized after the rehearsal dinner and missed the wedding. I wish more than anything that she and her husband had been able to attend, but I feel so blessed to have spent quality time with her at the rehearsal dinner. As you can imagine, I have a TON of recapping to do regarding the past few weeks! In the meantime, I’ll leave you with a few photos stolen from my friends off of Facebook (thanks, guys! haha) Without further ado- the marriage of Lulu and Mr. Wonderful! Hi lovelies! I have a big prayer request, and need your help. Mr. Wonderful’s mother was hospitalized last night with a terrible case of pneumonia and dehydration. Lucky for us, she is getting wonderful treatment. Also, Mr. W’s amazing sister is an ER nurse, and has been able to supervise her treatment. We’re hopeful that she’ll be discharged Friday afternoon, or Friday evening at the latest. Please pray that she’ll make a speedy recovery, and will be able to attend her only son’s wedding. Mr. Wonderful’s father passed away when he was in middle school, so not having either parent there to witness our union would be totally heartbreaking. I guess no mater how much you plot and plan for your big day, there are truly some things that you cannot control. I’m also having an internal battle with something I never thought I’d worry about with a spring wedding in Arizona- the weather. I was born and raised in Colorado, and still have many close friends and family that call the Rocky Mountains home. There is a radical snow storm expected to come in tonight, and at last update there are flights being cancelled left and right. Worst-case scenario, I’ll be missing a bridesmaid, a reader/favorite uncle, ring bearer, and a ton of amazing family friends. Please keep your fingers crossed that all comes out alright! I hope to catch up more tomorrow! 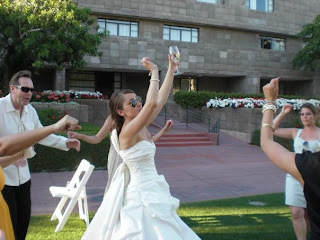 Need to tuck out now to finalize our DJ song list, corral information for a wedding party timeline, and finish the glass of hot champagne I’m drinking to de-stress from all the chaos. Big kisses from Wedding Central! Lulu here! I’m currently cozied up under the covers, snug as a bug in this divine resort bed. I’m wary from a long day and a shot of NyQuil, but decided that it’s more important to capture these last few pre-marital days on the blog than to fall asleep watching reruns of Everybody Loves Raymond! I’m sure my future children will get a kick to read this many years from now and see just what I was feeling the week I got married. I had a stress-free Saturday morning packing for the trip (and I *never* have a stress-free packing experience) and tidying the house for my 2 week departure. My flight from New York to Phoenix was truly entertaining. I spent much of the time talking about marriage with the 60 something year old man next to me, who was 27 hours deep into a flight from Pakistan to Phoenix to await the arrival of his grandchild. I also taught him how to use his personal airline TV set, which was quite a kick. The adorable attendants from JetBlue also comped my entire beverage bill! I never realized the effect the phrase “I’m getting married this week!” had on people. Thank you, lovely Jetblue ladies! My parents and their little yorkie Talulah picked me up from the airport, and ushered me back to the resort to begin one of the best weeks of my life. The hotel catering manager Lindsay hooked me up with the greatest room, I feel like a queen to be posted up here all week! I walked into my awesome new digs to find the piece de resistance- my wedding dress hanging on the closet door, fluffed out in all its glory. It’s so surreal to have it right here- makes me realize that I’m actually getting married in that dress. THIS WEEK! Thank you for all your prayers and well wishes about my health! I’m still battling a bit of a cold. It’s lightened up quite a lot, but I still have a pretty hoarse voice and need NyQuil each night to prevent coughing fits. I had to miss Easter mass, which was a bit of a bummer, but have been getting lots of well-needed R & R in preparation for the big day. We’ve also checked some big to do’s off the list. I had my hair trial this morning (loved it! ), picked up our wedding rings from the jeweler, and met with Liene, who is the ultimate wedding logistics guru. I can honestly say that I am still stress-free about the whole event, especially after the productive chat my mother and I had with Liene. I don’t know how to ever thank you enough, Liene!!!!!!! Tomorrow brings a meeting with the florist, more quality time with the parents, and hopefully a much-needed pedicure! I’m also full of excitement to see Mr. Wonderful, who arrives late tomorrow evening. We’ve had wonderful weather and smooth sailing so far, cannot wait to see what the next few days bring! I’m missing you all, and can’t wait to catch up more soon! Ladies, the wedding countdown has officially hit single digits. I leave Saturday morning to head off to the glorious Arizona weather, not a moment too soon. (It snowed here yesterday for a little bit ladies… SNOW in the middle of April!?!?! Come on.) I’m actually even able to check the weather on my wedding day now, since we’re within range of a 10-day forecast! We’re looking at mostly sunny, 89 degrees and 0% chance of precipitation. Since we’re having an outdoor garden reception, that’s just what I like to hear! I’d realyl appreciated of you could send up a little prayer for my health this morning- I am battling a serious head and chest cold right now. The thought of me sniffling and coughing on the alter gives me serious heebie jeebies… Please pray I get over this cold in time for my big day! I can’t wait to get settled in Phoenix for the week, so I can fill you in on the latest! Wedding SOS – Help Needed! 1.) I’m going to admit that I still haven’t purchased Mr. Wonderful’s wedding gift… I have NO FREAKING IDEA what to get the man!!!!!! What did you married girls buy your husbands? What do you creative gift givers think would be the perfect groom gift? 2.) Conversely, I have no idea what to politely hint for as *my* fantabulous wedding gift! What do you ladies think would be a dream come true wedding present to get from your groom? (And let’s be semi-realistic here, don’t think I’m going to walk outside to see a Jag with a big, red bow on the lawn… haha!) What did you newlyweds receive as a precious wedding gift from your grooms? *Pretty please* help a girl out! I’m completely clueless on both fronts! Happy Monday, little chickadees!!! We had quite the week last week in our little soon-to-be newlywed abode! I had my official orientation tour (which consisted, in part, of running into and saying hello to Christiane Amanpour, como se dice ‘awesome!’ en espanol!? ), had my last official weekend in NYC as a (insert maiden name here), and said out loud to the Mr. about a million times – “Do you realize we’re getting married in 2 weeks!? !” This time is FLYING by, and I feel like I’m just holding on for the ride! We’ve had a couple of mini-scares- one involving the groomsmen’s ties- big thank you Kate, from elefantitas elegres, for introducing us to the awesomeness that is The Tie Bar.- while packing them for the trip to Phoenix for the wedding, I counted them and realized that Mr. Wonderful hadn’t purchased enough of them. We rush ordered the final tie, crisis averted… Until I had a sinking suspicion that I should also double-check the groomsmen and ushers’ morning suit orders with Men’s Warehouse. Turns out, one of our groomsmen had yet to show up for his measurements, and the deadline was a scant 3 hours away. No fault of his own, really- he’s been on active duty in Iraq for over a year, and had just recently returned to the states. Luckily, Mr. W got in touch with him and had him phone in his measurements to be processed for the wedding. I’d be lying if I said I didn’t have a major internal freak out over the idea of being one morning suit short for the big day, but I’d like to think I handled it with style and grace (and a bit of vodka). With 12 days left until the wedding, we have a score of Lulu – 2, major disasters – 0! I also wanted to send some serious thank you love over to Mojito Maven– My darling MM and Mr. Mojito sent us the most *perfect* wedding present – a fabulous mojito kit! I about died when I opened it, it’s the most creative gift! Big thank you hugs and kisses to you, MM… Can’t wait for you and the Mr. to make it out to NYC for mojitos! While I was going through all of my honeymoon clothes, I realized that I had totally forgotten to get one of the key pieces to my honeymoon theme (you read that right- my honeymoon wardrobe has a theme and I *love* it!). I’ve been dying to get a classic L.L. 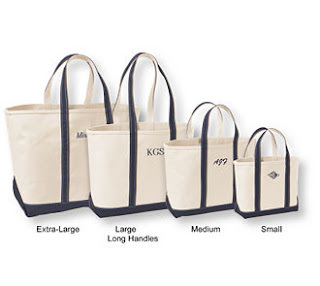 Bean boat tote in navy, with my new monogram on the side. I ordered one for rush delivery, and am praying it makes it to NYC before I leave! The Mr. and I took advantage of my new work-related 15% off discount at J. Crew by buying him a brand new honeymoon wardrobe. Thank goodness for my new discount, because this man did some serious damage! I swear, we’re going to look like a J. Crew catalog on our honeymoon. No complaints here, though! 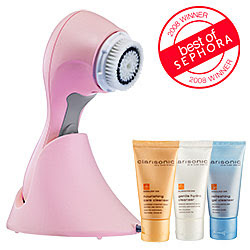 I also treated myself to a long-desired present – the Clarisonic Skincare Brush! I’ve decided to start buying myself one fun treat each paycheck, and this seemed like a fitting pre-wedding splurge! I’ll let you all know how the results turn out. I also received a little splurge from Mr. Wonderful after his shopping spree – he took me to Williams-Sonoma for a little treat! 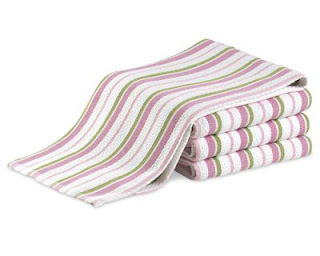 I have been completely obsessed with the pink and green kitchen towels and dishcloths for as long as I can remember… The Mr. bought me a set of each in the pattern below! I hope you all had a happy and eventful weekend! Sneaking another secret post over lunch… Aren’t you loving how I live on the edge right now? Seriously, ladies? *Miracle* product over here. You literally just grab a bag out of the freezer, toss it in the microwave (no venting needed), and cook the sucker for about 5 minutes. That. Is. ALL! Perfectly steamed veggies for the laziest of cooks- no chopping, no mess, nada. It’s obvi a bit more pricey than just buying the veggies and steaming them yourself, but find it WELL worth the extra coin (which I am still watching like a hawk, despite being employed again). 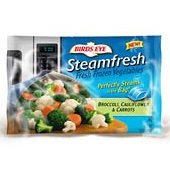 I’m munching on a bag of broccoli, carrots, and cauliflower right now to accompany my Weight Watchers Smart Ones (Lasagna Florentine, if you’re curious). Consuming the entire bag is a scant 1.5 points! There is more food in my cubicle than I could possibly consume right now, which never seems to happen when I’m watching my point intake. These little frozen pouches are miracle workers at home too, since they’re a painless way to get in your veg at dinnertime. The Mr. and I have gone through 1-2 bags a day since we discovered them, and feel SO much better knowing that we’re getting in a good daily dose of veggies now. You should pick up a bag and let me know what you think! I’m getting married this month. I’m coming to you live from the cubicle that I should *NOT* be blogging in, but I cannot help it. I feel like a little addict, sneaking in a quick post while nobody is looking. Shhh! I can’t tell you how much I MISS BLOGGING right now! There is so much going on in my life now that I want to share with you ladies, but I can’t seem to find the time to get it out there. The biggest is obvi the wedding, which is in a whopping 17 days. Almost all of the details have been solidified (yay! ), but there is still one big, gaping hole that needs to be filled. Mr. 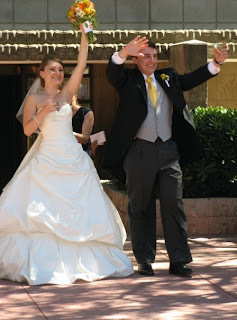 Wonderful and I are having 2 priests at our wedding- the “main” officiant that will be marrying us (the Mr’s surrogate father), and the former priest from the Mr’s prep school will be assisting. Our second priest will be giving the sermon, and has asked us to “write a paragraph about why you love each other” so that he may echo our sentiments to one another during his homily. Um……. Let me get this straight- the reasons why I love the Mr., in 1 paragraph, and completed in 2 days? Commence small wedding freak out—-NOW. 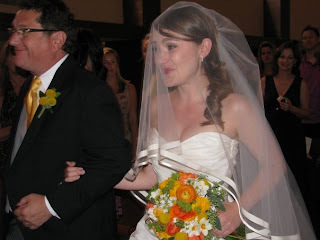 One of the secret reasons I loved the idea of a traditional Episcopal wedding ceremony was the fact that I didn’t have to write my own vows. The thought of having to sum up all my feelings of love and devotion in one short excerpt scares the *living daylights* out of me… I thought I had dodged a bullet on that front by going the traditional route? Ummm, notsomuch. I have precisely 2 days pour my heart out into 1 paragraph, and send it along to be parceled out into a speech for all to hear. I can literally feel my blood pressue rising as I type this.